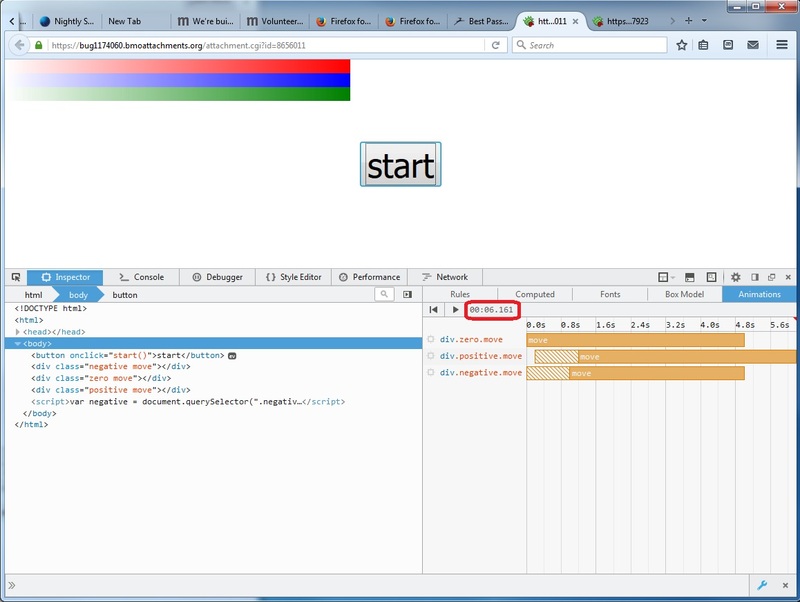 For bugs in Firefox DevTools, the developer tools within the Firefox web browser. 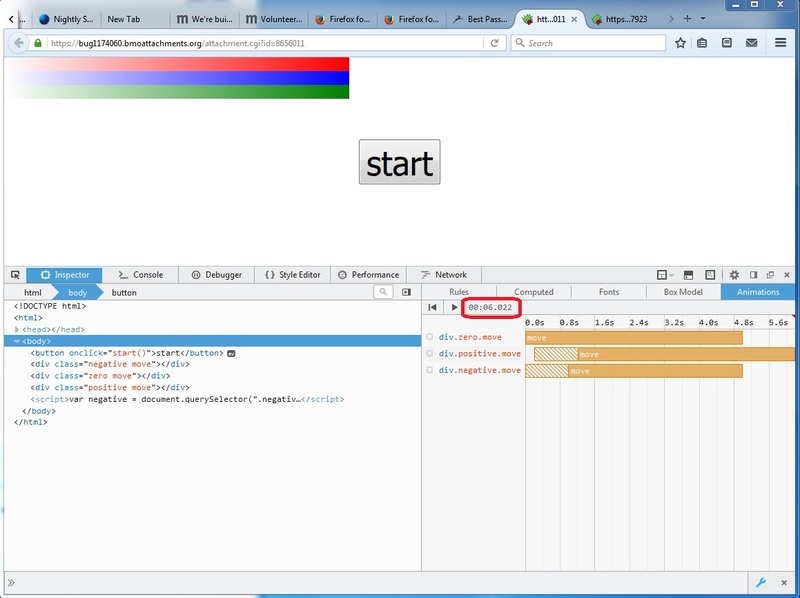 This includes issues about the user interface of the toolbox, special pages such as about:debugging and about:devtools, and developer-related APIs. For issues relating to the Animation Inspector within Firefox Developer Tools. When an animation ends, the time label stops as well. But the final time is different for each playback. The time label updates using a requestAnimationFrame loop on the client-side. At each iteration of the loop, we detect whether the animations are done or not. If they are, we stop the scrubber and time label, but this could be a few millis after the actual end. We should make sure we position the scrubber and time label exactly at the right end time. I think it's good like this. I removed a test in displayTimelineCurrentTime, which prevented the time-label to show the animation end time ( because the animation was not paused nor infinite ). I think it was here to prevent the time-label to show a number higher than the animation length, but I'm not sure of this. The tests all PASS, so I guess it's fine. Let me know if something is wrong, thank you. Maybe move this variable declaration just before the if where it's used, for better packing. I don't know if I did it well though. > hg qref --message "try: -b do -p linux64,macosx64,win64,eslint-gecko -u xpcshell,mochitest-dt,mochitest-o,mochitest-e10s-dt -t none"
I don't know if I should restrict the push to my bookmark only. But I don't think that it's because of my patch though. > I don't know if I did it well though. > > hg qref --message "try: -b do -p linux64,macosx64,win64,eslint-gecko -u xpcshell,mochitest-dt,mochitest-o,mochitest-e10s-dt -t none"
> I don't know if I should restrict the push to my bookmark only. Looks like whatever you did worked! I don't think the --bookmark part was required anyway. When you push to try, you *force* push (-f) with your current commit being the one with the try message. This will push all the commits that try hasn't seen before. So if you updated recently, you might be pushing commits that just landed on fx-team and that try hasn't seen before. That's fine (there's one in your try push for instance: 8be8932a2e0f). > The job is over. > But I don't think that it's because of my patch though. Yup, seems unrelated, and there's already an intermittent failure bug opened to track this: bug 1244270. May I ask you if you are willing to vouch for me to be a Mozillian (  https://mozillians.org/en-US/u/chevobbe.nicolas/  ) or should I contribute more to consider it ?